Raise your laptop and monitor off your desk, to create a dual-display workspace and increase productivity. This monitor arm lets you create a convenient and cost-effective dual-monitor workspace, using your laptop as your secondary display. It features an integrated stand that elevates your laptop off of your desk, seamlessly aligning it with your other display.Integrate your laptop display to provide enhanced productivity. The tray lets you adjust the height of your laptop, so that it's in line with your monitor, giving you the same functionality as a dual-monitor setup without having to purchase a second monitor.With two displays you have the extra screen space that you need to simplify multitasking and maximize productivity. Using two displays makes it easier to reference material on one monitor while working on the other, saving you the time and hassle of having to flip back and forth between documents. Plus, for viewing longer pages or blocks of code without having to scroll down your screen, the LCD arm also supports simple landscape-to-portrait display rotation.The flexible monitor arm and stand let you extend, tilt, and swivel the monitor and the laptop with a full range of motion across multiple axes, with spring-assisted height adjustments for effortless positioning. It makes it easy to create an ergonomic work environment that's tailored to your specific needs.The versatile arm lets you elevate your laptop and traditional monitor stand off of your desk. 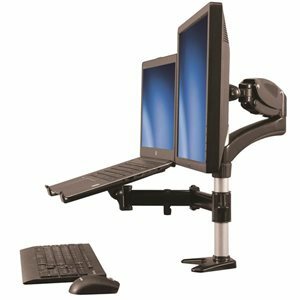 This gives you more surface area for additional hardware or for completing physical tasks such as drafting or reading paper documents.The monitor arm is perfect for smaller work environments, like cubicles, providing everything you need while using less space.Also, by combining the arm with a monitor, laptop, docking station, keyboard and mouse, you can comfortably set yourself up at a hot desk in the office, and easily recreate the same setup at home. It's perfect for business travelers and users who are constantly on the go.The monitor arm supports a display of 15 to 27" up to a maximum weight capacity of 17.6 lb. (8 kg) and features cable management clips to help keep things neat. The integrated laptop stand also supports a weight capacity of 17.6 lb. (8 kg) and offers its own integrated cable management clips. Integrate your laptop display to provide enhanced productivity. The tray lets you adjust the height of your laptop, so that it’s in line with your monitor, giving you the same functionality as a dual-monitor setup without having to purchase a second monitor. The versatile arm lets you elevate your laptop and traditional monitor stand off of your desk. This gives you more surface area for additional hardware or for completing physical tasks such as drafting or reading paper documents. The monitor arm is perfect for smaller work environments, like cubicles, providing everything you need while using less space. Also, by combining the arm with a monitor, laptop, docking station, keyboard and mouse, you can comfortably set yourself up at a hot desk in the office, and easily recreate the same setup at home. It’s perfect for business travelers and users who are constantly on the go.